If your Toddler is anything like mine, then they will have a fascination with an emergency service of some kind! My Son has been through the Fire, Police, and Ambulance Service, with the Coastguard thrown in for good measure. Here we take a look at some of the best Fire Station toys for Toddlers. Fire safety is extremely important, and by allowing your Toddler to play with a Fire Station toy, it will also allow you to introduce the danger of fire to your Toddler, but in a fun way! Along with a Fire Station toy, you might also want to consider a Fire Chief outfit, so they can really spark their imagination! 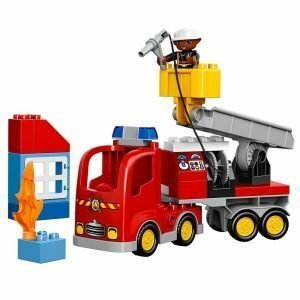 The Lego Duplo Fire Station toy is awesome fun for a Toddler! It comes with a Fire Truck, Station, and various other Toys to enhance the fun! 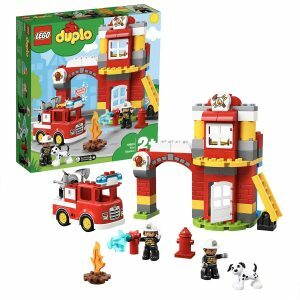 The Duplo Town Fire Station is perfect for imaginative little heroes! I absolutely love Duplo and Lego because it allows my Son to build his own toys and use his imagination, whilst developing his motor skills. Construction toys will present your Toddler with the opportunity to develop important life skills, such as spatial reasoning, creative thinking, and cognitive flexibility. The Fire Station is easy to build (being Duplo, it always is! ), and is a great way to introduce your Toddler to the concept of building and creating their own toy. Your Toddler will spend hours popping up the fire in random places, before rushing the Fire Truck over to be the hero and save the day! Also included in this kit is an adjustable ladder and a dog figure. Please remember to put the Duplo away if it is being stored! I have stood on too many pieces to neglect that rule! The Happkid Fire Station toy has realistic siren sounds to fully immerse your Toddler into play time! Made of non-toxic ABS material, the Happkid Fire Station has realistic lights and sounds, along with some other emergency service toys that your Toddler can enjoy. Right from the off your Toddler can immerse themselves with the roleplaying. As soon as the fire is reported, the fire chief can use the spinning pole to get to the fire truck or helicopter. After rushing to the scene of the fire, your Toddler can use their imagination to bring in the rest of the emergency services to ensure the job is complete! The Happkid Fire Station is an excellent opportunity for roleplaying, and may also drive your child’s future career options! The Toot-Tool First Station has a spinning pole, pop-up fire, and a fire truck with movable ladder to keep your Toddler entertained! If there is one thing I remember from my toys as a child, it is the classic road/toy sets, just like this Toot-Toot Fire Station toy from Vtech! Your Toddler can use the many vehicles to navigate through the roads putting out the pop-up fires which are scattered around the track. There are options to play with the helicopter, ambulance, or fire truck too. Many toys such as this option are flimsy and break very easily, but you will be pleased to learn that the Vtech is extremely well built. It is clear that the manufacturers understand just how destructive a Toddler can be! In terms of sounds (to keep your Toddler entertained further), the Vtech has 2 sing-along songs and 6 melodies that are sure to get on your nerves! 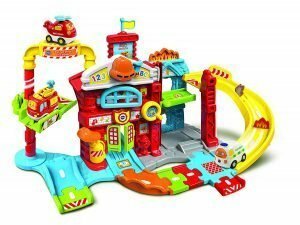 The Vtech Fire Station can also be used to develop your Toddlers motor skills as it comes with 6 interchangeable track pieces to spark their imagination. All Duplo toys are awesome, and the fire truck building kit is no different! Although there is no Fire Station that comes with this Duplo version, I had to put it on this list simply because it is Duplo! Let’s not forget that your Toddler has an incredible imagination, so anything can be the Fire Station! This Fire Truck is very easy to build, and I know I have mentioned it a few times on this post but building this Fire Truck will help to develop your Toddlers motor skills. The best thing about this Fire Truck is the crane on the back which is adjustable and allows the Fire Chief to get to those hard to reach places when tackling a fire. Along with the Fire Truck, you will also receive a pop-up fire and a window. I am not sure why the window is included…but I am not the one with an incredible imagination! Develop your Toddlers motor skills by giving them playtime with 3 emergency service vehicles! 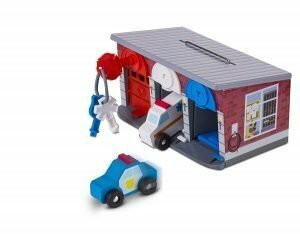 I have covered this toy in my post about lock and key toys for Toddlers, but as it has a Fire Truck and Fire Station, it had to be on here too. Melissa and Doug are renowned for creating fun, educational toys for Toddlers. Along with the Fire Station and truck, this toy also comes with a Police car and an Ambulance. The toy has a sturdy carry handle which can be used to transport it with ease. The vehicles are very well made and glide across the floor with ease (a huge plus for those who do not want their floor damaged!). Toddlers love roleplay, especially when it comes to emergency services! Roleplaying an emergency service is very rewarding and allows your Toddler to flex their troubleshooting muscle whilst also playing the hero. 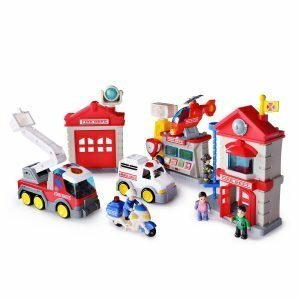 A Fire Station toy, along with the additional items will give a Toddler many scenarios to play through, and considering their imagination they will never run out. Most of the toy options on this page also include mini figures, a Fire Truck, and a pop-up fire. Your Toddler will spend hours pretending to respond to various fire emergencies. Not only is a Fire Station an excellent toy from an imagination point of view, but it will also begin to teach your Toddler to respect the services and the people working for them. It will also begin to build cause and effect relationships. If I were looking for a Fire Station Toy for a Toddler then any of the options of this page are an excellent choice! When looking for a new toy, always consider what your Toddler is already into. My Son loves Lego/Duplo, and spends a lot of time playing with figures. For this reason, I put the Lego Duplo Fire Station toy at the top. Your Toddler might be different, so take a look through all of the options and decide which one is better suited.